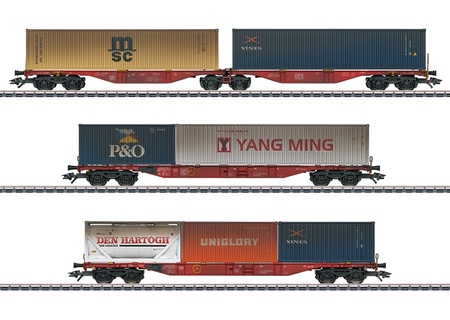 Prototype: A type Sggrss 733.2 6-axle double container transport car with articulation and two type Sgns 691 4-axle container transport cars. "Traffic Red" basic paint scheme. German Railroad, Inc. (DB AG). Transport cars loaded with 20-ft. and 40-ft. box containers as well as a 20-ft. tank container for various firms. The cars look as they did in Era VI. Produktet er utsolgt, og ikke lenger tilgjengelig.